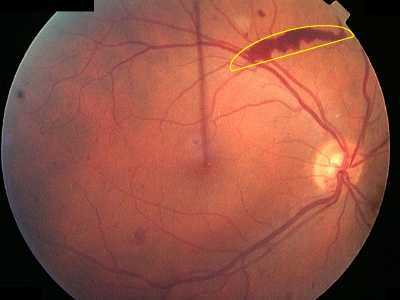 New vessels form abnormal adhesions with the vitreous humor and this can lead to haemorrhage. Where there is localised detachment of the vitreous blood can accumulate between the retina and the vitreous adopting the characteristic appearance of a subhyaloid haemorrhage. This is often said to be boat-shaped (in this case the boat has clearly capsized! ).